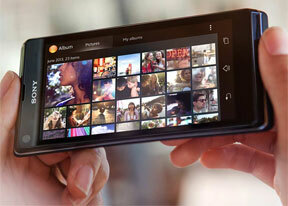 The Sony Xperia L is equipped with an 8 megapixel camera that can produce still shots with a maximum resolution of 3264 x 2448 pixels. The camera interface consists of two panes and is unified with the camcorder one - you can start snapping away or shoot a video without the need to change modes. The right one holds four virtual buttons - a shortcut to the gallery, video and still shot shutter keys, and a primary/secondary camera toggle. On the left you get the shooting mode selection key in the top corner, followed by three customizable shortcuts. The final shortcut here opens the drawer with all available settings for the given shooting mode. Naturally, the Sony Xperia L camera offers all kinds of features, including face detection, smile shutter, geotagging, touch capture and HDR mode. There's also the home-baked quick launch mode, which lets you select what the camera shortcut on the lockscreen does. You can go for simply launching the camera in either still or movie mode, or you can set it to immediately snap a photo/start capturing video. This might come in handy for those occasions when you are worried that you might miss a shot, but it is also useful for when you don't want to waste your battery keeping the camera interface constantly going (it's a real battery hog). The image quality of the Sony Xperia L camera left us with mixed feelings. It resolves a decent amount of fine detail and while saturation is good, colors are often off. Noise is fairly high as well, so the overall output is hardly the best in the 8MP league. Then again, there's quite premium competition there, so the Xperia L still remains one of the most competent shooters in its class. HDR mode is available too, helping you bring extra dynamic range to both the shadows and highlight ares of your shot. It's quite quickly, but the over-exaggerated HDR effect might not be everyone's cup of tea as it gives images a very unrealistic look. The Sony Xperia L makes its appearance in our dedicated photo comparison tool. To challenge it we've selected the BlackBerry Q10 messenger and Google's device the Nexus 4 but feel free to pit it against any other foes. The Sony Xperia L is capable of capturing 720p video footage at 30fps, which is what you'd expect from a lower-midrange device in today's market. However, as a nice extra touch, the smartphone also offers HDR for video capture, making it one of the few devices to have this feature especially in this price bracket. What came as a disappointment for us is the fact that even though the Xperia L is able to capture still shots while recording video, it only produces images at 1MP resolution - which is the same as extracting a frame from the video. More crucially though, Sony Xperia L just doesn't record good video. The clips shot with it look like upsized VGA footage as they lack detail and look all pixelated. Colors are good and framerate is steady at 30, but the lack of detail really ruins the whole experience. Strangely enough videos have more than enough bitrate at about 12 Mbps mark, so you can't really blame it on compression. There's stereo audio recording at a 94 Kbps bitrate, which while low is still more than most other mid-rangers can offer. HDR videos are also present on the Sony Xperia L and unlike some other implementations we have seen they do make a difference. However, with the video quality so poor in general, there's barely much sense in shooting HDR either. And here's a 720p@30fps sample for direct download. The Sony Xperia L joins our video quality comparison pool. We've chosen the Galaxy S III mini and Nokia Lumia 720 as its rivals but you can choose any other. Sadly in this competition the Xperia L falls into non-relevance all too quickly.